For nearly 15 years I chemically straightened my thick, tightly curly hair. In July of 2010 I felt compelled to embrace the hair I was born with, so I did the "big chop" (cut off all my chemically relaxed hair) and went natural for the first time in my adult life. Learning how to do my natural hair was quite the process. I often found myself detangling my hair for hours on end and burning a rather large hole in my bank account by purchasing super expensive products. Yes, I have to admit I was one of those girls who bought the $40+ products from Miss Jessies, and no they didn't perform any miracles on my hair. Lesson learned. In the 2 years since that time, trial and error have shown me many affordable products that work for naturally curly hair. 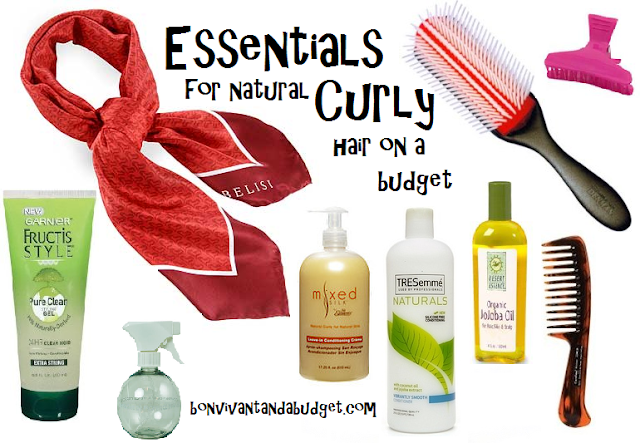 So, I created this post to share with other curlies on the natural hair journey - and a budget, of course! Wide tooth comb $2 or Denman brush $15 (well worth the investment). Use this to detangle your hair in the shower with conditioner; this will greatly reduce breakage and knots. Sulfate free conditioner. My preference is for Tresemme Naturals Conditioner... 25 ounces is only about $5 at Target, Walgreens or CVS. You will use this for co-washing your hair. Oil of your choosing- jojoba, coconut, castor, or even the virgin olive oil in your kitchen. Once you have moisturized your hair with the leave-in-conditioner, you will use this to seal moisture in. Spray bottle - You can make your own concoctions in this bottle. I often mix jojoba oil, water and leave in conditioner and then mist it all over my hair. You can buy a spray bottle at the dollar store or any beauty supply store. Gel - when I want to wear my curls defined, I need some kind of gel to be finger combed through my hair. My preference is for Garnier Fructis Pure Clean Gel which retails for about $3 - $4. What are your favorite hair products? Leave your comments below. It's like you read my mind about this. Yesterday, I was thinking why doesn't someone do a post on super tight curly hair & what products that work. I don't chemically treat my hair since it's super fine, but very curly if I don't straighten it & sometimes wear it curly, but still don't know the right products that would keep it looking moist after it dries without it being greasy or crunchy from gel. I'm glad you enjoyed the post, Rebecca. Natural hair care could legitimately be a college degree program in and of itself. There is sooooo much to learn... I am still learning and frankly, don't care to stop. Once we have knowledge, why not share it with the world, right?! Thanks for stopping by! Stay safe from the storm!